Look, I don’t think The Division and I are ever going to be best friends. I don’t particularly like games where you shoot numbers out of people, I don’t particularly like games about loot, and I don’t particularly like games that place a heavy emphasis on cooperating with random Internet folk. The Division is all of these things, and so is the sequel. Meanwhile, I do like games that have a strong narrative element, that actually try to say something about what they present through their themes and systems, and that don’t rely heavily on repeating the same simplistic feedback loop over and over. The Division is none of these things, and neither is the sequel. As you can probably guess at this point, I didn’t enjoy playing The Division 2 all that much. To me it’s the gaming equivalent of Huel (careful, Rick, that's my lunch you're talking about! - ed.). It’ll fill you up, but you’re not going to look back in five years’ time and say, 'Oh man, I really loved that glass of Huel.' (We'll see... - ed.) That said, it is a better game than the original Division. The combat is improved, the set-piece missions are a little more inventive, and the whole thing is better paced and feels a little more dynamic. One thing that demonstrably hasn’t improved, however, is the storytelling. In fact, I’d argue that The Division 2 is markedly worse in this area than its predecessor, because at least I had a vague understanding of what The Division’s story was about. Here? No idea. The best I can surmise is that it takes place some months after the first one, and you play as Gruff Military Human, dispatched to Washington, DC in order to liberate it from the grip of several armed gangs. 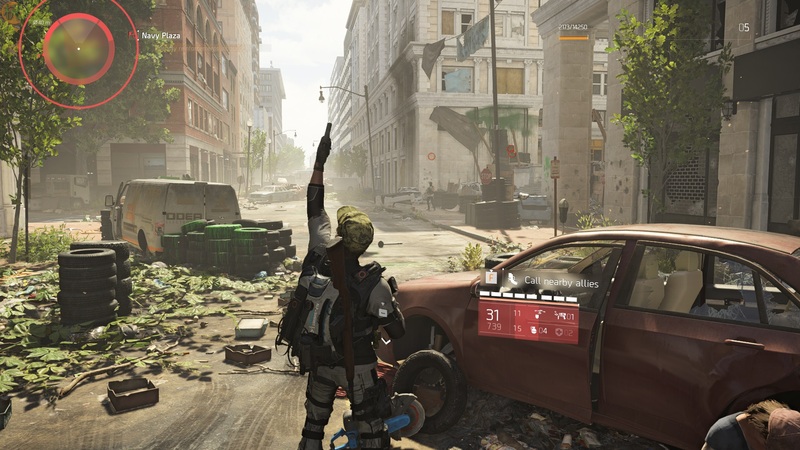 The Division 2’s lack any meaningful plot or characterisation shouldn’t be surprising, given how as with the first one the developers have reiterated that the game does not make any statements or commentary about its own setting. But it’s almost impressive how narratively vacuous The Division 2 is. It also doesn’t work, because any game set in the real world in which you use guns to solve social problems is making a statement, even if it doesn’t mean to. 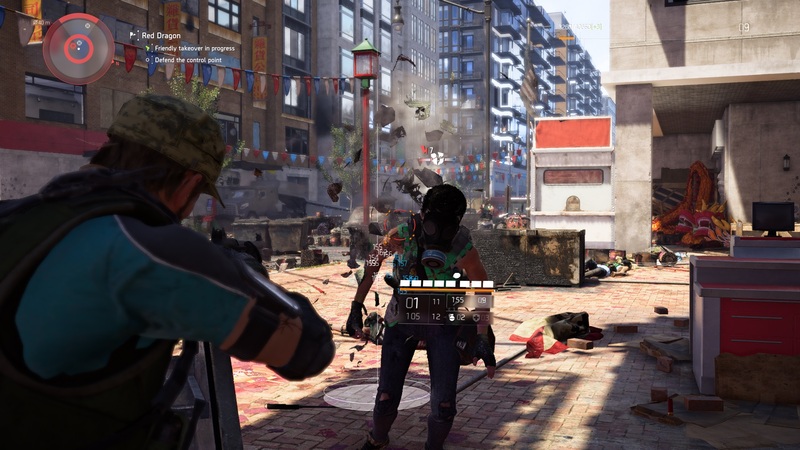 What The Division 2 lacks instead is substance, at least from a thematic perspective. It is narratively inert, emotionally cold, and devoid of any artistic significance beyond the next gun upgrade. Anyway, that’s all I’m going to say on that. From a purely mechanical perspective, there are marked improvements here. 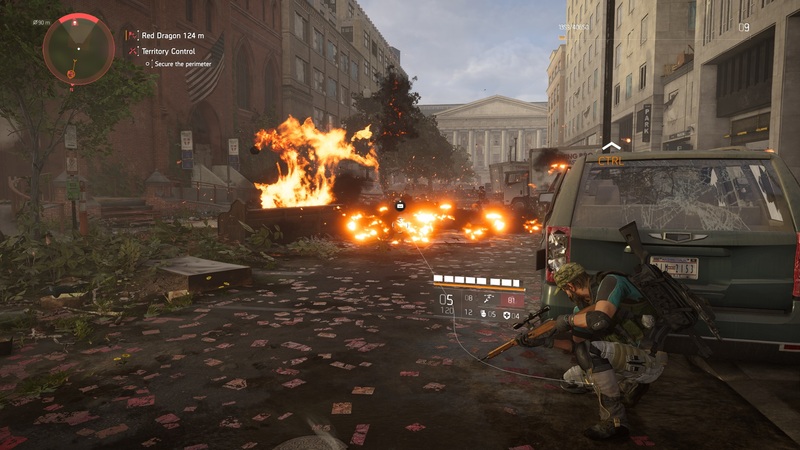 As with the first game, The Division 2 is about retaking control of a city, bringing militant order to militant disorder. You do this by completing main-missions, side-missions, and a whole host of random and semi-random activities. In many ways it’s the most Ubisoft of Ubisoft games, frequently vomiting out icons across a map for you to diligently clean-up. The difference here is that the fixed missions are much better crafted, while the randomised elements are much better paced. Most of the main-missions take place in unique and distinctive settings. One sees you fighting through the museum of American history, trading bullets amongst the exhibits, while others include a TV broadcasting station and a planetarium. Side-missions tend to be less spectacular but are still surprisingly substantial. One, which involved taking control of a rooftop garden, involved navigating an enjoyably knotty series of blown-out apartments. 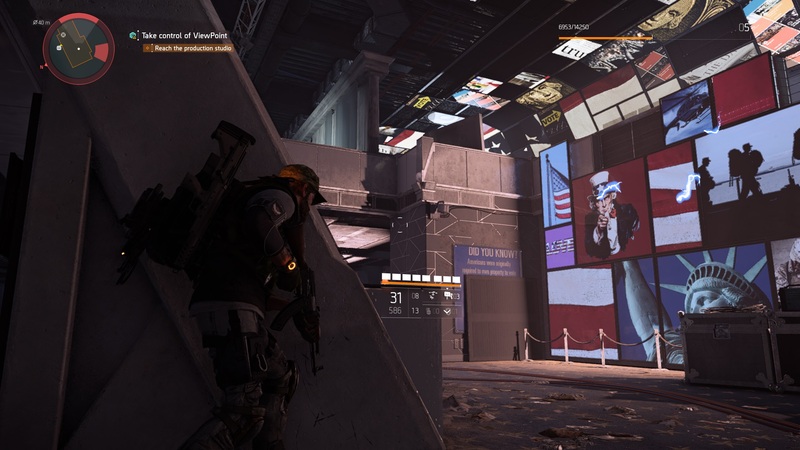 Outside of missions, you spend a lot of time exploring the streets and alleys of Washington, DC In some ways it’s an even less distinctive setting that the first one’s New York, lacking the attractive white winter-coat sprinkled across The Division’s Big Apple. The grid structure and flat terrain also make D.C. rather unremarkable to navigate, at least in the early game. That said, Massive Entertainment does try to break up the repetition. Streets are littered with ruined cars, chemical spills, and huge piles of trash-bags, while later areas like Potomac Park provide a welcome change of scenery. D.C. makes up for its less personable-appearance, however, with a greater sense of dynamism. This is partly aesthetic, with highly changeable weather and AI wildlife wandering the streets, but it’s also baked into the systems. Now roving squads of bandits will get into street-fights with allies on supply-runs, while semi-random objectives such as hostage rescues and territory disputes will crop up as you explore. Combat too is demonstrably improved. 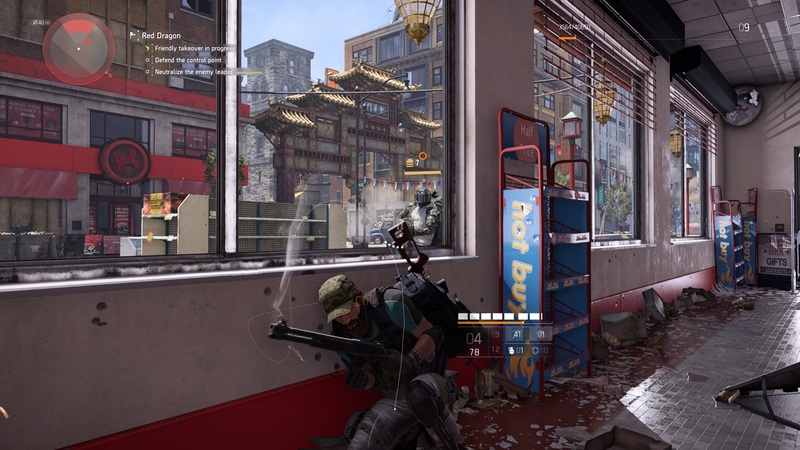 Although you’re still shooting numbers out of people, The Division 2 feels less RPG-ish in its gunplay. Nearly all of the weapons are satisfying to wield, and the game does a decent job of providing a broad and regular influx of new weapons. I can’t get excited about a new set of kneepads though. I mean, come on. As for equipment, alongside returning deployables like the drone and the gun-turret are more colourful abilities like the Hive, which accosts enemies with a swarm of mini-drones. Meanwhile, the Seeker mine rolls along the ground to a specific location before exploding. In addition, all your skills can be customised to perform several different tasks. The drone, for example, can be specced to heal allies, deflect bullets, or simply pepper enemies with gunfire. Perhaps the biggest improvements to combat are found in the enemies you fight. The three gangs who prowl Washington, DC are distinct both in how they look and how they fight. The Hyenas, for example, are basically Mad Max cosplayers who’ve taken it too far. They fight chaotically and aggressively, with melee units that try to rush you and SMG-wielders who casually walk through the thick of battle, spraying you with bullets. The True Sons, meanwhile, adopt a more military approach to combat, attempting to flank you and use heavy machine-guns to lay down suppressing fire. There are some issues with the combat. The cover-system can be overly sticky, and trying to fight enemies at close range is a bit like trying to swat a fly with your nose. It’s also not particularly innovative. Even with all the bells and whistles attached, there are times when it descends into monotony. 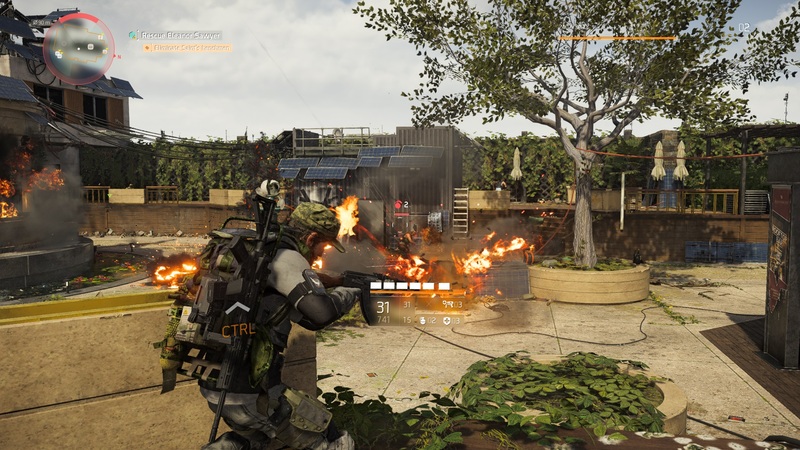 It’s worth noting that, while undoubtedly better as a cooperative game, it is just about possible to play The Division 2 solo, although you’ll need to be very careful about the weapons and equipment that you pick (I found heavy machine-guns and long-range rifles to be a particularly effective combo). For the most intense fighting, players will want to head into the PvP areas. Washington, DC features three Dark Zones rather than one, each of which provides a very different competitive arena. There’s a bombed-out suburban town, and an area so overgrown with vegetation it takes the phrase Urban Jungle to the next level. 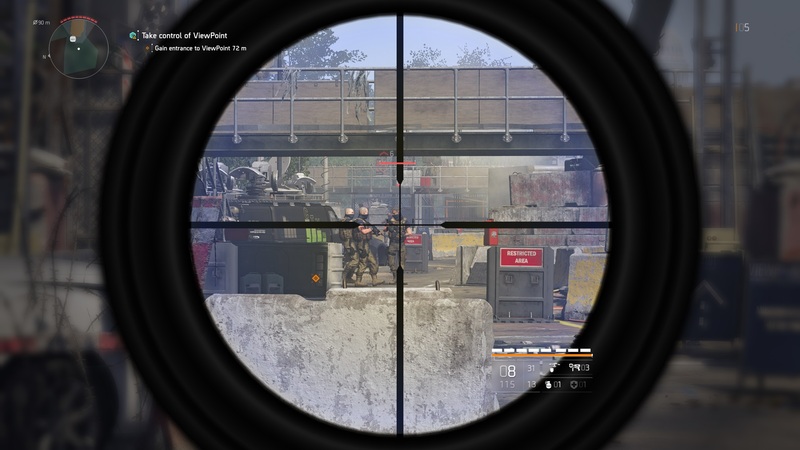 It’s still probably the best part of The Division’s experience, but the gap between PvP and PvE is no longer quite as cavernous as it was when the first game launched. There’s no question in my mind that The Division 2 is a better game than its predecessor. However, it’s just not for me. Not all of this is about taste. The UI, for example, is horribly designed, a confusing mass of icons and sub-menus that is downright unpleasant to navigate. Exploring the open world can also be frustrating. It’s very easy to stumble into an enemy patrol and be killed within seconds, which catapults you back to the last safehouse or settlement you visited. 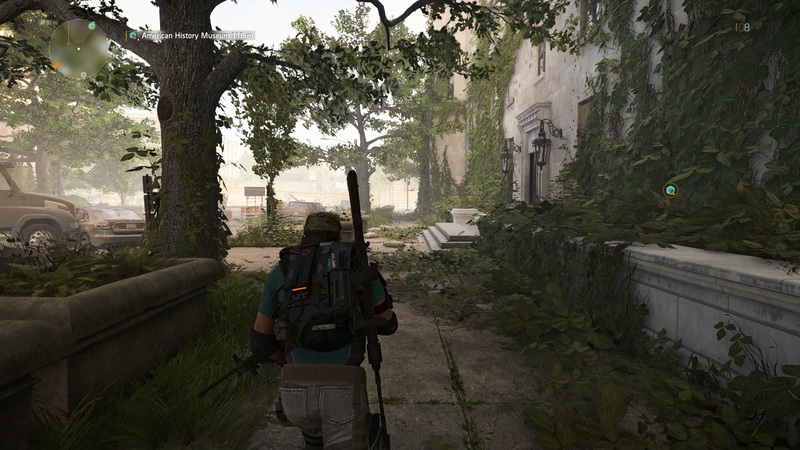 My main problem with The Division 2, however, is that even at its best, it is entirely derivative. The Division is basically Gears of War in a less interesting setting (and with less interesting combat), stretched out over 30 hours. Yes, it’s open world and online, but at the core it’s a fundamentally similar experience. If you’re a fan of Destiny-style games, you’ll probably get a kick out of this. As someone who isn’t the biggest fan of that type of game, however, The Division 2 didn’t win me around. A handful of patches and a few months later, and The Division is ace. Big, bombastic and bland, the Division is a confused mixture of tactical shooter and MMO design.